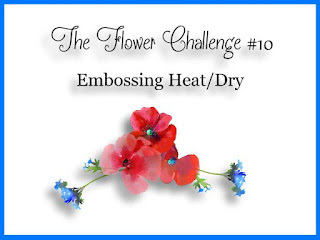 Hello everyone: Once again, it's time to send out a little reminder to you to join us at THE FLOWER CHALLENGE. 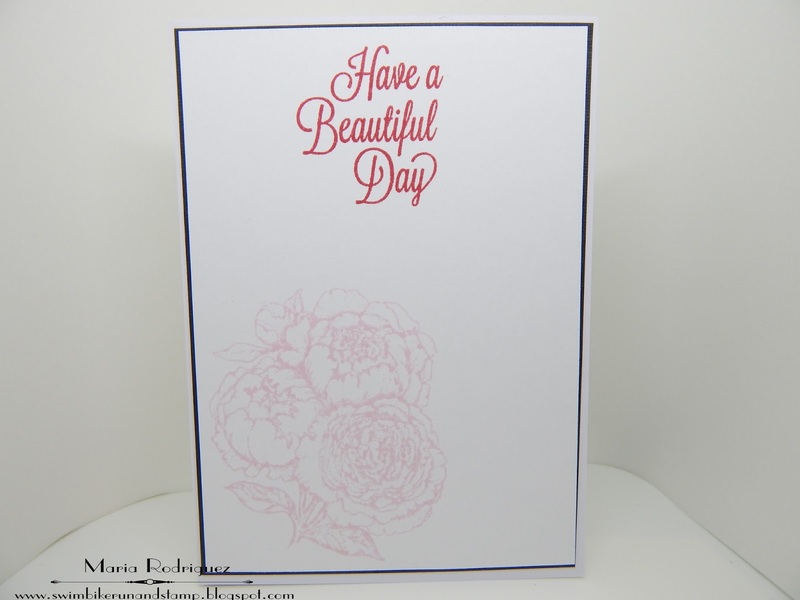 In this challenge we want to see you create your cards using either DRY EMBOSSING OR HEAT EMBOSSING or both. Here is the card I made to inspire you to join my teammates and I in our gallery. The other day, I saw THIS VIDEO TUTORIAL from StampTV., about how to "color" with Bleach. I was intrigued, I never thought of Bleach as a stamping tool, 😲 sheeesh!! I just use it for the laundry!!! but non the less, I decided to give it a try, the results were awesome!! So, for my card I picked this beautiful bouquet from a Power Poppy set called Countryside Bouquet Deluxe. First I sponged some Distress Inks in Spiced Marmalade and Ripe Persimmon on a panel of water color paper, then I stamped the flowers with Versmark ink and heat emboss it with white embossing powder. Then I went over the flowers with a small brush dipped in the bleach and just touched some areas, the color immediately started to fade so I was real careful not to do to much. I love the way this turned out, and the best part of all, is that there is no bleach smell when it dries. Then, I made a cut on either side of the stems and wrapped some twine a few times and tied a bow. I stamped part of a sentiment from the Power Poppy set called Azaleas and die cut the word "Amazing" with an Elizabeth Craft Designs die. 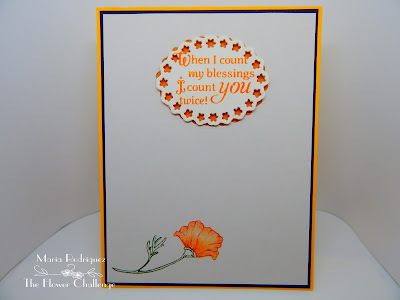 The sentiment is from an old Flourishes set called "Dahlias", it was also die cut with THIS Spellbinders die set. The flower at the bottom is from the same set as the front flowers. I colored it with Prismacolor pencils. 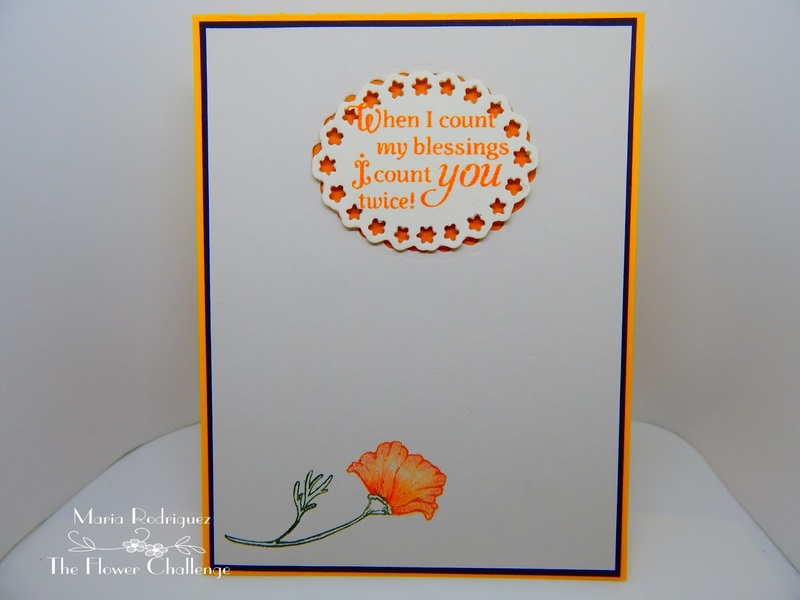 I hope this card inspires you to join us in THE FLOWER CHALLENGE gallery. Please add our challenge banner to your post when you enter our challenge. Please check our rules, there are simple but important. So, pop over THE FLOWER CHALLENGE to see my teammates amazing inspiration cards and join us in the gallery, we can't wait to see what you create. Hello everyone: I made this card yesterday but, as it's usually the case, LIFE got in the way and I couldn't take pictures or write the post until this morning so, here it is, hope you like it. 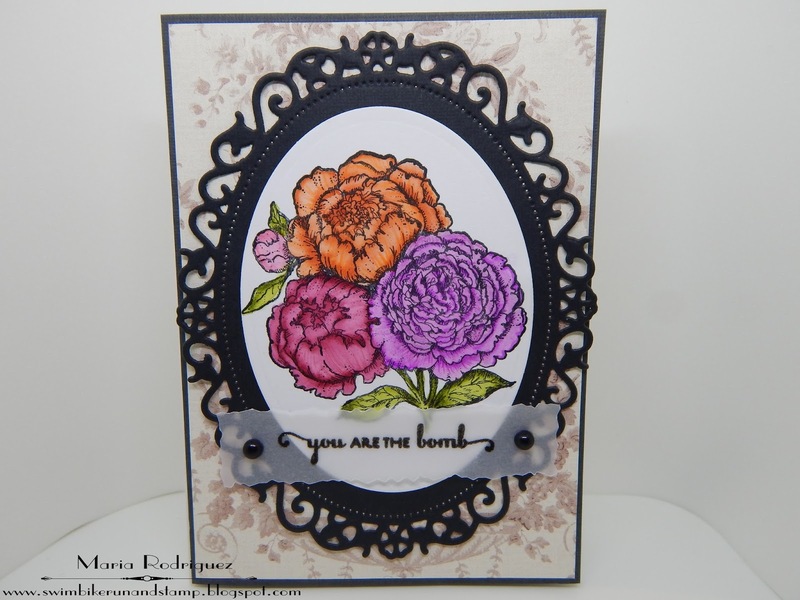 This beautiful image is from the Power Poppy set called Dynamic Duos:Peonies and Tulips. I stamped with Stazon black ink on Strathmore water color paper and colored it with SU markers, an aqua painter and Prismacolors for added shadows. The black die cut is from Spellbinders, pattern paper from my stash. 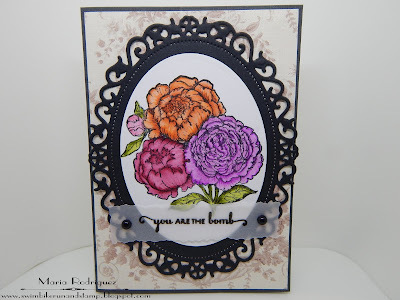 I don't have a smaller image of a Peony for the inside so I just stamped the same image but with Spun Sugar Distress Ink, the sentiment is from an old Flourishes set called "Tulips for Friends"
The Sisterhood of Crafters "Where in the World?" I live in Indiana and the State Flower is the Peony. Peonies are also called "Bombs" hence the sentiment. The Paper Shelter Challenge #302 "Punches or Dies"
Hello dear blogging friends: I love the CAS style of card making but sometimes I find it a bit difficult to leave a lot of empty space on my cards but, none the less, once in a while I venture into making this very elegant and, well.....simple cards to get used to the guidelines for CAS. 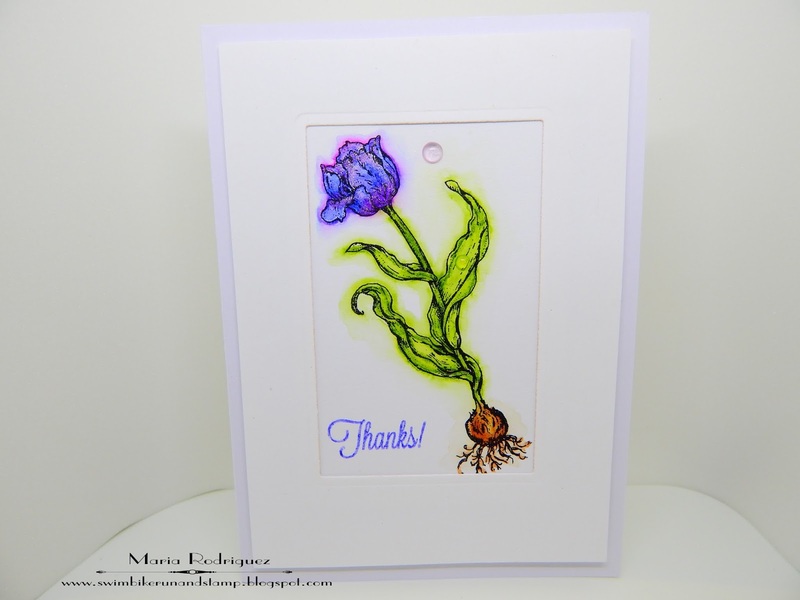 This week over at SHOPPING OUR STASH we want to see your interpretation of this style of card making, so I hope my card inspires you to join my teammates and me in our gallery. I love SHOPPING MY STASH of very old and retired stamp sets, I have a ton of Flourishes sets that I absolutely love, this image is from one of those retired sets called "Tulips for Friends" that came out back in 2013. I stamped it onto a die cut piece of watercolor paper with Stazon black ink and colored it with some of my Sakura Koy watercolors. I always save the negative piece of die cuts, I have a nice stash of them in a box ready for when I need them. I really wanted to color this Tulip and leave it alone but, as I was finishing adding some shadows to the petals, my aqua painter decided to jump off of my hand and it landed on the bottom left side of the flower making a big smear of paint on it. I gasped!! !😨, my first impulse was to just start over but, I really loved the colors I got on this flower so, I decided to fix it somehow. I tried to remove the ink with a small brush and water but, all I achieved was to make the ink bleed so, what the heck!! I went around the whole image with my brush dipped in water and that was that!! 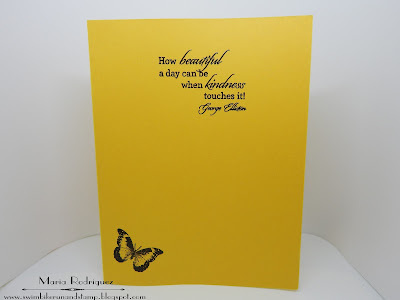 A small sentiment and a couple of Nuvo drops completed this card front. The sentiment is from another Flourishes set called "With Gratitude", the little tulips on the bottom, from "From the Garden", colored with Prismacolor pencils. So I hope you give this challenge a try, go check out the SHOPPING OUR STASH challenge blog to see my teammates awesome creations. And, for your 411, July 12th. 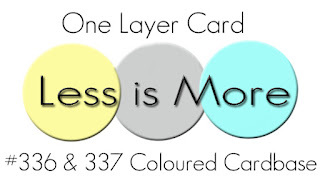 is Simplicity Day, CHECK OUT THIS LINK to this blog and find out how you can simplify your life, there are some awesome quotes there that I've been implementing in my craft room. 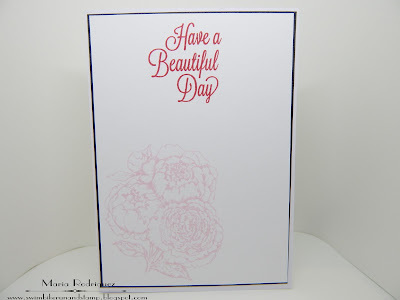 Hello dear blogging friends: I love, love all kinds of styles for making cards but there is one style that always intimidates me a bit.....CAS!! Yes, yes, I know, what's so hard about it?? Well, I often need to fill up the space and that is a BIG No No!!! But, none the less, I enter this challenges just to be able to practice and learn, how else am I going to get any better in teaching my brain it's ok to leave empty space around so, here is this card I made for the Less is More Challenge #336 & 337, which is collaborating with the AAA Cards and the talented DT's are asking us to make a "One Layer Card" with the added "bonus" of using colored card stock, anything but white is to be used. 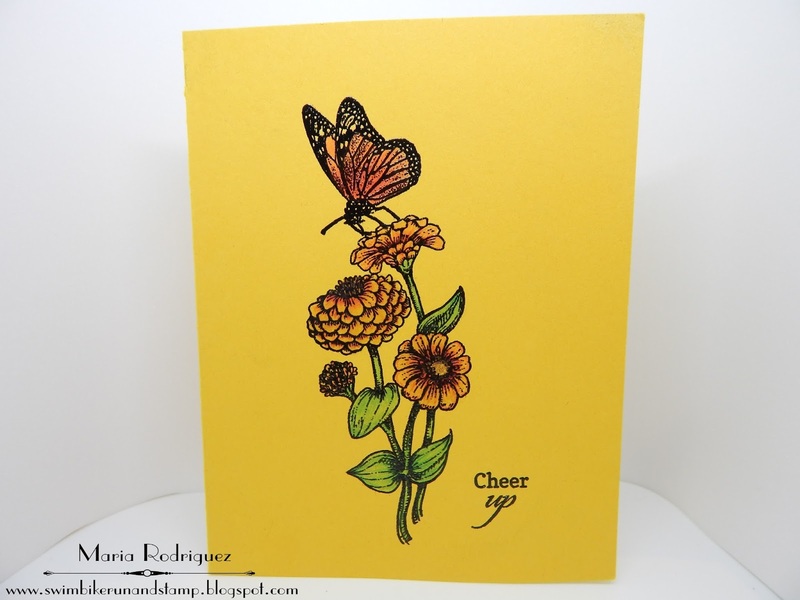 This image is from the retired Flourishes set called "Zinnias", the butterfly is from a set I've had for years but I don't know it's name or where it came from, it has 9 gorgeously detailed images. I stamped the flowers and the butterfly onto a single, yellow card base first with Stazon black ink, color them with my Prismacolor pencils, easy peasy, and once it was finished, I stamped it again with Versafine black ink and heat embossed it with clear embossing powder to make the lines visible again, the pencils kind of made them look opaque, I just left the images on my MISTI so I could stamp them again in the exact same place. Here is a picture of the finished inside of my card, I also left this with no layers. 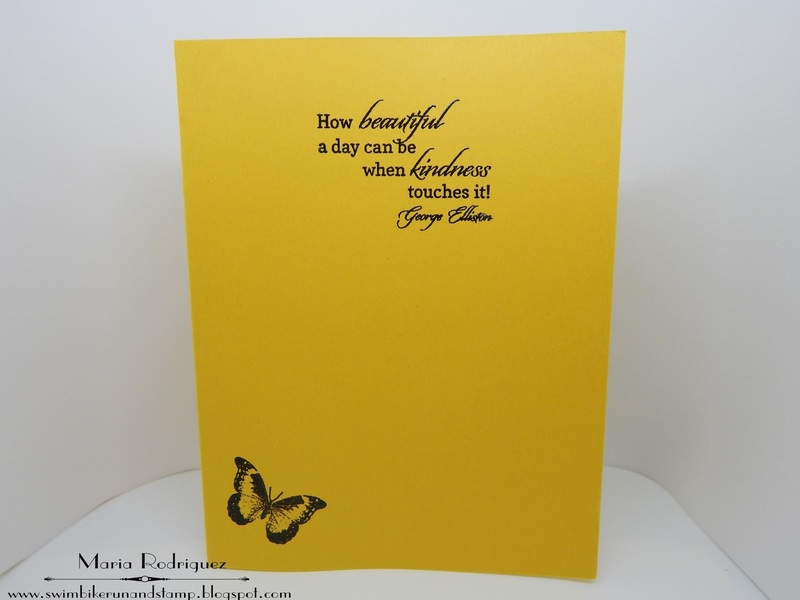 Both the sentiment and the butterfly are from the same sets. 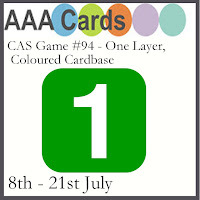 AAA Cards: CAS game #94 A collaboration with "Less is More"
International Art and Soul Challenge #12 "Elements of Nature"